Thursday February 8, 1923 Wrote Hattie in AM. and did fancy work. We went down town for a little while in afternoon to do errand. A letter from Fannie. They report it very cold up home now. Friday February 9, 1923 Busy all the short forenoon. Went to town in afternoon. Did some errand and went to see "Monte Christo." It was nearly six oclock when we started home. Weather perfectly delightful. Letter from Birdie Saturday February 10, 1923 I did some washing for my self and cleaned up stairs. We went to town early as Mrs Folk was going to Deland Junction. I spent the afternoon with Mrs Pickens. 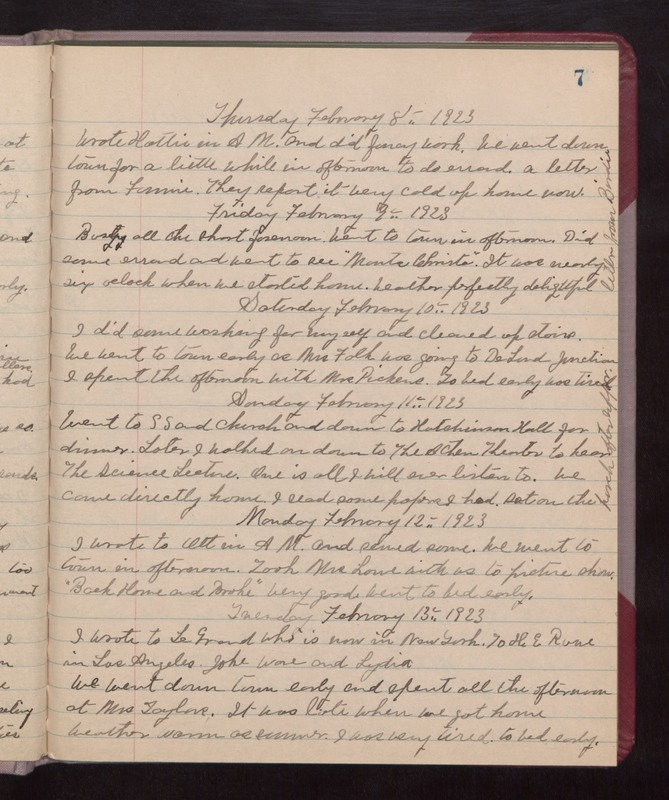 To bed early was tired Sunday February 11, 1923 Went to SS and Church and down to Hutchinson Hall for dinner. Later I walked on down to The Acten Theater to hear The Science Lecture. One is all I will ever listen to. We came directly home. I read some papers I had. sat on the porch after supper. Monday February 12, 1923 I wrote to Ott in AM and sewed some. We went to town in afternoon. Took Mrs Lowe with us to picture show, "Back Home and Broke." Very good. Went to bed early. Tuesday February 13, 1923 I wrote to Le Grand who is now in New York. To H E Rowe in Los Angeles, Jake Ware and Lydia. We went down town early and spent all the afternoon at Mrs Taylors. It was late when we got home. Weather warm as summer. I was very tired. to bed early.